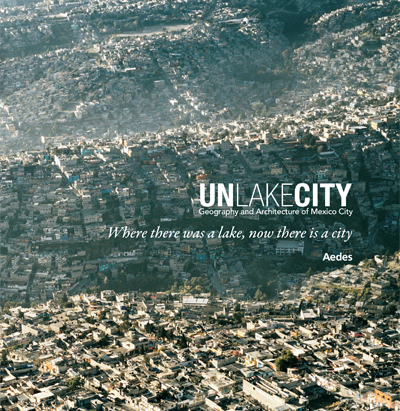 UNLAKECITY – WHERE THERE WAS A LAKE, NOW THERE IS A CITY. Geography and Architecture in Mexico City. A window to visualize the situation of Mexico, the most populated city in America founded at 2000 m above sea level. The exhibition at AEDES Architecture Forum in Berlin, divided in two sections reflects in the first one, the history of the city through the geographic and hydrologic conditions. The second part shows ongoing large scale projects to take a glance into what Mexico City actual or future condition is. Papalote Children’s museum in Iztapalapa is shown in that second part. Our project, emerging from a game of linear patterns defining programmatic zones, and linking public spaces directly with the exhibition areas, developes into a reinforced concrete modular system of structures that takes special attention to the foundation solutions water level and soil conditions. The published catalogue itself is a very unique document that compiles centuries of transformation of the place in which there was a lake, and now there is a city.